ALC provides hosted services (requiring no onsite equipment) which are easy to use and cost effective for organizations of any size. Features and services previously available to large enterprises are now available to any size organization. Audio Conferencing: Same phone number and same 4-digit access code every call, operator assisted calls and call recording available. ﻿Web Conferencing: Web-based, features include chat, desktop/region and file sharing, participation tools, pass floor from leader to attendee. Marketing on Hold: Custom productions, 4-5 minutes, 400-500 words. Entertain and inform your customers while on hold, increasing call retention. 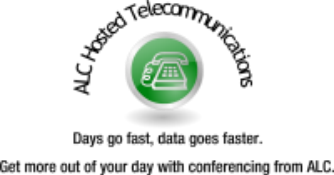 Automated Messaging/Auto Dialer: Quickly communicate with clients or employees via phone or text. E911 Enable: Ensure your organization is 911 compliant (mainly for companies over 40,000 square feet or with multiple campuses/buildings). When a call goes into a 911 dispatch the operator can determine exactly where the caller is located regardless of where phone is registered.